Caritas Jordan volunteers packing aid for Syrian refugees in at the Caritas centre in Mafraq. Photo by Caritas Jordan. “I like to help others,” said Madleen Qandah, a 21 years old mathematics student in Mafraq. She is volunteering with Caritas Jordan as it aids Syrian refugees fleeing violence in their own country. “I just put myself in the refugees’ shoes and treat them how I would like to be treated in the same situation,” she said. Around 500 refugees arrive a day in Jordan according to various relief agencies. The Jordanian government says the number of Syrian refugees in the country has surpassed 110,000 people. The influx of Syrians is putting huge pressures on the Jordanian economy and housing capacity. The country is also hosting 450,000 Iraqi refugees according to the government, who fled the conflict in Iraq that began in 2003. Working mainly in Mafraq, Caritas Jordan teams have provided 500 families with aid such as heaters, bedding, towels, plastic mats, sanitary pads, jerry cans, milk, school and kits, hygienic kits and food since December 2011. Caritas is also referring refugees for registration with the UN refugee agency UNHCR. In March, Caritas Jordan also distributed food and non-food items to over 300 extremely vulnerable families in Ramtha and Mafraq with the support of Caritas Germany. The work is being carried out with the help of young parish volunteers. Together with the Caritas team, the volunteers have begun working on a distribution plan, they have learned how to deal with the refugees and distribute aid to them effectively. 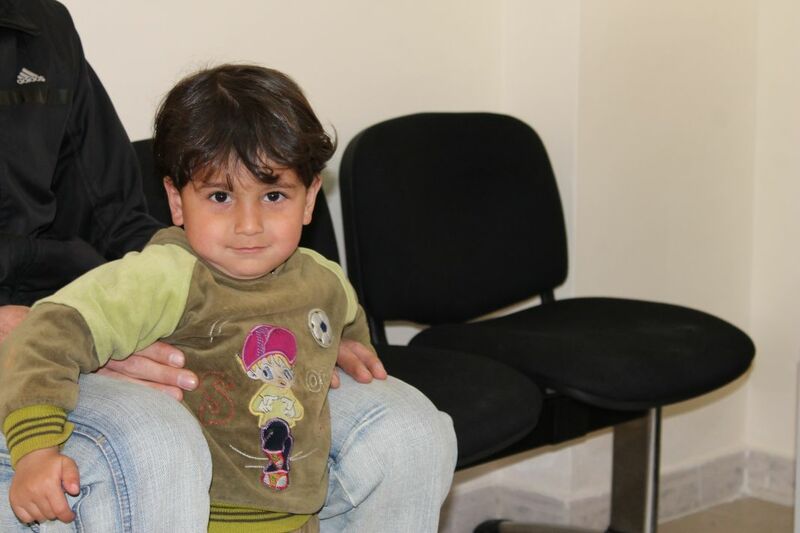 A Syrian child at the Caritas Centre in Marfaq, Jordan. Photo by Caritas Jordan. “I love to be engaged in such activities,” said Mouyad Sahawneh, 24 years old civil engineer. “Since I have recently graduated from the university and am still looking for a job, I can`t help people with money so I am really very happy that I can help at least this way and be of a benefit to my community”. Fr Francies Shahin and Fr Sami Qandah of the Catholic and Greek Melkite churches are providing logistical support to Caritas staff and volunteers to receive the refugees and give them help. In cooperation with the Mennonite Central Committee (MCC), Caritas has also been issuing vouchers enabling Syrians to receive infant formula and nappies from a Caritas affiliated pharmacy in Mafraq. MCC spoke with Reham*, one of the Syrian refugee receiving help from Caritas Jordan. Reham is a mother of three whose husband ran a beauty salon in Dir’a. They lived comfortably until the shop was destroyed during a government crackdown on an opposition protest last year. The family stayed in Syria for the next year, living off their savings and in spite of the continuing violence. In February 2012, their house was bombed, leaving them with no shelter. Their lives were spared because they were visiting an uncle at the time. That was when the family decided to leave Syria. They fled to Mafraq to join other Syrians in the spare rooms, warehouses, schools or tents that pass for home these days. The conditions can be tough. MCC reports of another family recieving help through Caritas in Mafraq. They live in a 20- by 14-foot room in a warehouse, with plastic bags pushed around the door to keep out the cold. The walls are mouldy and dirty. A small kitchen and a bathroom are attached. The father is deaf and the wife has had a nervous breakdown. They have two young children. The father’s two brothers and uncle and their families live in rooms nearby. The uncle came to Jordan so that his 12-year-old son could get treatment for a bullet wound near his eye. “I feel that I can contribute to the happiness and relief of these families,” said Wajdi Haddad, a 22 years old student and also a Caritas volunteer at the centre. Caritas Jordan says they are blessed to have these volunteers. As well as offering humanitarian aid, the volunteers are also giving respect and love to those in desperate need. The volunteers say it’s a live-changing experience. “I used to think of volunteering more as activities inside my parish,” said Amal Haddad, an 18 years old student. “But now I understand that it is something that liberates me from social chains and makes me a productive individual to my society and neighbourhood”. Thanks to MCC for permission to use parts of Meeting basic needs of Syrian refugees in Jordan from the MCC website.